Works selected by contemporary artists Nigel Rolfe, Franko B, Leah Capaldi and Jack Tan will be exhibited in a night of Performance Art at the Royal College of Art. Following a week-long programme of intensive coaching and development, proposed work by students will be selected for an evening of performance at the Battersea campus of the Royal College of Art. As part of the college’s interdisciplinary initiative (AcrossRCA) students from design, animation, visual communication and fine art will be taken through a process of proposal, development, refinement and selection for Performance Night at the RCA. The event makes apparent how other disciplines, as diverse as industrial design engineering or textiles, can enter, enrich and inform performance art. Questions are raised about how performance consists as a field of enquiry, its development, and the permeability of its boundaries. 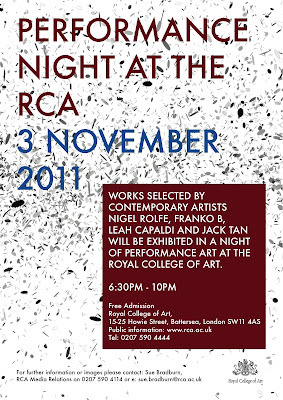 The Performance Night exhibition takes place on 3 November 2011, 6.30pm to 10pm. Franko B - SOMEONE TO LOVE - Peter Scott Gallery, 21st October - 12th November 2011.
will exhibited in a night of Performance Art at the Royal College of Art. Following a week-long programme of intensive coaching and development, proposed work by students will be selected for an evening of performance at the Battersea campus of the Royal College of Art. As part of the college’s interdisciplinary initiative, students from design, curating, animation, visual communication and fine art will be taken through a process of proposal, development, refinement and selection for Performance Night at the RCA. The event makes apparent how other disciplines, as diverse as industrial design engineering or textiles, can enter, enrich and inform performance art. How performance consists as a field of enquiry, its development, and the permeability of its boundaries. 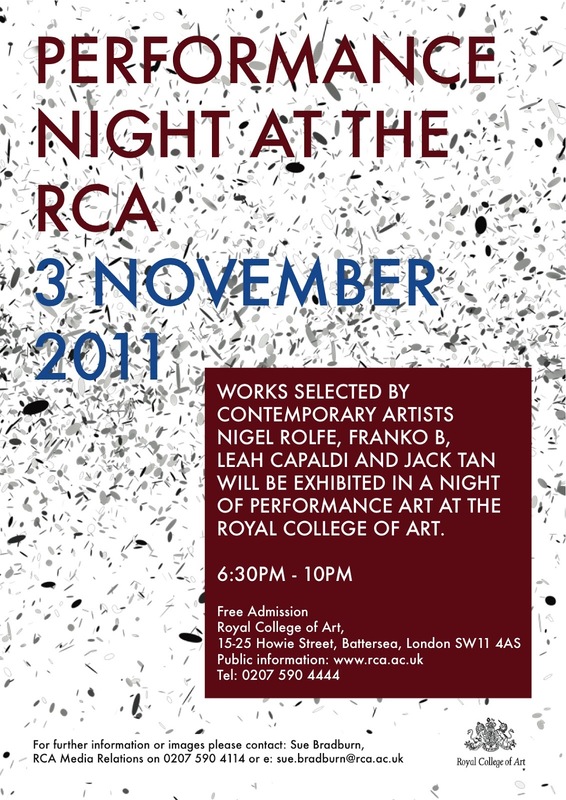 The Peformance Night exhibition takes place on 3 November 2011, 6.30pm to 10pm. 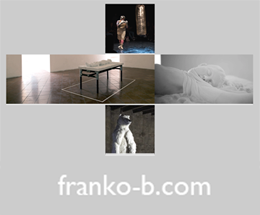 http://www.franko-b.com has been updated (October 2011). New content added to gallery, text and events pages. Franko B will perform I'M THINKING OF YOU on 25th November 2011 at the Who's Afraid of Performance Art festival at GRÜ, Geneva. Plus Art Projects’ alternative Frieze show ‘Neon + Vinyl’ is exhibiting new art works in neon and vinyl by Tracey Emin, Sarah Lucas, Gavin Turk, Franko B, Regina Silveira, Amanda Eliasch, Melville Mitchell, Peter Lamb and Paul Hosking, Alex Baker, Phill Wilson-Perkin, Seamus Farrell, Warren McLachlan, Tim Bromage, Mark Croxford, Morag Myerscough, Luke Morgan, Kim Fielding, Dominic Allan, John Tiney, Jason Davidge, Stik, Marcus Mitchell, Jason Minsky, Giorgio Sadotti, Nick Kennedy, Will Strong, John Close, Will Marshall, The DnA Factory, Peter Ainsworth, Gemma Land, Damien Good, Dingbot McLatchley, David Wood, Craig Robertson, Sarah Blood, Laura Graham, Jonathan Wright, Ken Graham, Jim Woodall, Pete Jones and Amelia Newton Whitelaw amongst others. The show is unique in drawing together a wide range of creative talent to work with media traditionally associated with street level advertising and industrial processes. 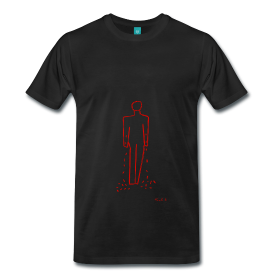 We are challenging artists to subvert these media and find new ways to communicate. Curated and produced by neonist Kerry Ryan, artist Declan McMullan and Jessica Temple, ‘Neon + Vinyl’ is the fourth Frieze week show from Plus Art Projects. The Londonewcastle Project Space is a gallery and exhibition space in Shoreditch created by property brand Londonewcastle as a platform for creatives and artists to display their work and further their practice. The gallery is donated to users who might not otherwise have the opportunity to show their work and forms part of the ongoing local cultural discourse.